A whole lot of cleaning fatigue can be averted if you are careful about not letting dust settle in the first place. What do we recommend? Learn from the Japanese culture! Leave dirty shoes/sandals at the door or at least arrange shoe mats with rough textures to scrape off as much dirt off the shoes as possible. Avoid placing carpets in rooms with windows/doors, especially if you live in dusty areas. Eventually, lesser dust would mean lesser work for you! Have toddlers at home? Is your husband a slob? Murdered someone in the living room? Don’t sweat it; just blot it. The best way to deal with spillages is to act FAST! First step is to soak it up with a towel or a wet/dry Vacuum. Next, use dishwasher water mixture for non-water spillages, followed by a plain water mop up. The key is to use blotting motion instead of the scrubbing motion. Why? 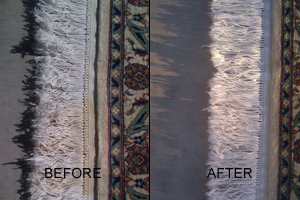 Because scrubbing will cause your carpet fibers to become matted and lose its color and texture. 3. Home Remedies Always Trump Commercial! • For stain type: Food/beverages/blood: 3% Hydrogen Peroxide solution applied directly to stain and blotted can save discoloration. • For stain type: Mud/dirt: allow it to dry before brushing it off. Use above procedure if needed along with soap water. 4. Flip It And Beat It! Here’s a fact about carpet dust: it causes a tremendous amount of guilt. The longer you let it stay there un-vacuumed, the deeper it will set inside the fibers and the greater difficulty you’ll face to get rid of it through daily vacuuming without seeking expensive professional help. Thus, flip the rug occasionally for better and deeper cleaning. You can easily flip over regular synthetic rugs and vacuum over their backs. Beat brushes normally manage to push the dirt off. Moreover, for deeper cleaning, you can flip a side and keep repeating the process until you’ve got the complete rug covered. This would eventually improve dust expulsion by up to 45%. Repeat this process at least every two weeks, if not every week. If you think Afghani/Persian/Navajo rugs are expensive…. You are absolutely right! Oriental rugs can be wallet stranglers. Buying woolen or hand woven rugs may be pricey (so are rug-cleaning services), but they are much more dirt resistant and tend to last longer. However, regardless of the rugs you opt for, it is advised to always attain surface cleaning services from the experts once every few months to give your rugs a brand new look even after years.